JOHN MIDDLETON is the founder of the Bristol Management Research Centre. Recognized as a leading expert in personal and systems thinking technologies, he works as a coach and consultant with individuals and organizations that are determined to make best use of the future. He is the author of two books, Smart Things to Know About Your Career and Writing the New Economy. BOB GORZYNSKI has worked extensively in the fields of strategy, change management and customer care with both large international organisations and at owner manager level. After spending 10 years in corporate finance and strategy in blue chip companies he has specialised in aligning the technical and the human aspects of strategic change. He currently specialises in the media, entertainment and retail sectors. 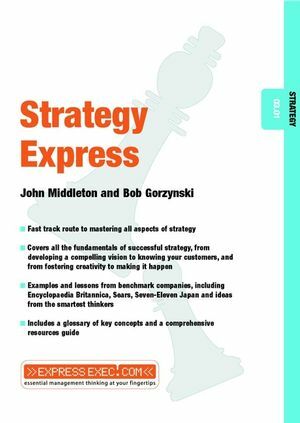 Definition of terms: What is a Strategy?